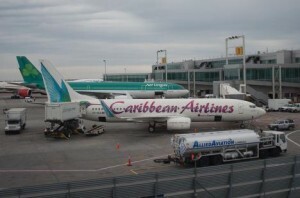 PORT OF SPAIN - The Trinidad and Tobago-owned Caribbean Airlines is reporting increased revenues despite a 32 per cent increase in the price of fuel, and it says it’s continuing on a path to profitability. The airline said in a statement today that ongoing strength in passenger revenues, cost management and network efficiency saw it continue its robust performance for 2018 to date. Its unaudited half-year (January -June) results for 2018 show revenues and earnings significantly improved over the same period in 2017, despite the impact of higher fuel costs. Revenue has increased year on year by US$31.3 million, or 19 per cent, while Earnings Before Interest and Taxation (EBIT – Operating Profit/Loss) improved over the same period in 2017 by US$17.8 million or 77 per cent. Chief Executive Officer Garvin Medera said he was delighted the team at Caribbean Airlines “has seen the results of its hard work with another improved quarter, demonstrating we are making clear and sustained progress on our path to profitability”. “This is being driven by our focus on a better experience for customers, combined with ever more efficient use of our resources and our route network,” he added. Other highlights for the six-month period included improvement in line cargo and freighter operations revenue and operating profit improvement; increased passenger numbers and load factors both regionally and internationally; and increased air bridge capacity and efficiencies to service peak travel. “At the same time as improving our financial performance, we are also rapidly innovating in technology and services to improve the customer experience,” Medera added, pointing to the latest addition, Caribbean View, which provides enhanced inflight entertainment direct to passengers’ personal devices at no extra charge. Several new products, features and services were announced during the first half of 2018, along with Caribbean View which will be officially launched on August 1. They include: Caribbean Upgrade, which allows economy class ticket holders to bid for available business class seats on all eligible routes; Caribbean Plus, a new option offering additional comfort with extra seat space and boarding benefits on economy fares; Caribbean Explorer, which gives travellers the ability to go to several islands using one affordable fare; online miles redemption; introduction of Webchat and WhatsApp for Business to enable a personalized digital option for customers to chat with a call centre agent; and implementation of new routes to Havana, Cuba and non-stop service between St. Vincent and the Grenadines and JFK, New York.